Looking for an affordable electric-acoustic guitar? We must say Dean Acoustic Electric Guitar Review is the best thing you need right now. Today, we are going to present you with what we think one of the best instruments you can get. While being relatively inexpensive, the Dean St. Augustine Dread Cutaway GN offers some great features for its price. The low price makes it a particularly good choice for beginning guitar players who have yet to discover their own musical taste. Did we make you excited about this acoustic-electric guitar? To find out whether this instrument suits you or not, let’s get started with our Dean Acoustic Electric Guitar Review! Do you want to have a gorgeous guitar? If so, SADC GN will surely make you want to buy it! Built of such materials as mahogany and spruce, this guitar features traditional looks yet can quite impress even the most demanding buyers. Besides, the cutout design of the guitar adds a nice touch to the guitar’s great appearance. Worried about the durability of the guitar? The solid spruce top has an excellent weight-to-strength ratio, making it lightweight yet fairly durable. So do the mahogany back and sides! Being built of mahogany as well, the C-shaped neck is another aspect of this guitar’s reliability. 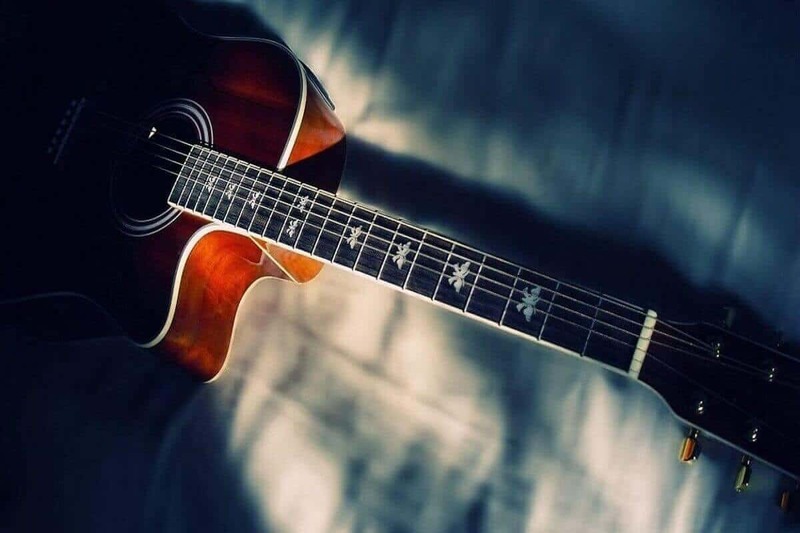 The 20-fret fingerboard built of premium-quality rosewood will make your experience with SADC GN much more memorable and unique. Besides, it features die-cast tuners for easy string adjustment. Wonder what the cutout does actually do besides making the guitar look great? It makes accessing those last frets of the fingerboard much easier. You should seriously think about getting this guitar if you spend quite some time on them. Remember we were talking about the excellent weight-to-strength ratio of the guitar’s materials? Thanks to them, you won’t have to worry too much about not getting fatigued during your practice or performance. You will surely be able to deliver your masterpieces to your audience non-stop! The guitar strings are especially easy to adjust as the instrument features die-cast tuners. You will be able to regulate the sound of the guitar whenever or wherever you like or need. No more buzzing from your guitar! The ergonomic body shape of the guitar and the C-shaped neck will fit anyone to allow comfortable play both standing and sitting. A quite important feature for any guitar, and SADC GN surely doesn’t lack it! 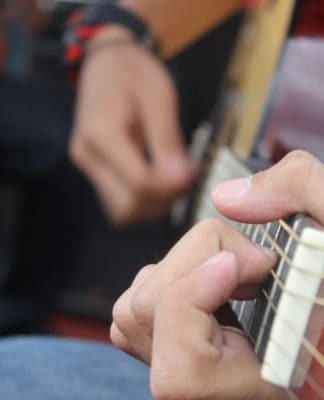 Did you know that body materials and shape of a guitar greatly affect its sound? The spruce top makes it more resonant and won’t become overloaded no matter how intensively you play. In its turn, mahogany attaches more mid-range tones and brightness to the sound of the guitar. You could say that the combination of the wood makes the guitar sound more harmonic. Don’t forget that wood matures, making the sounding even more refined! The cutout also makes its own contribution to the sound by somewhat reducing the bass. With all this, you end up having a pretty balanced guitar! At last, as the guitar features onboard preamp with tuner and volume controls, you could pretty much make the guitar sound the way you like! As we have just mentioned, SADC GN comes with a built-in preamp with tuner and volume controls. This is the exact feature making this guitar a perfect choice for beginners. With this guitar, you won’t have to increase your budget and dedicate space for a full-sized amplifier. Besides, as a beginner, you probably won’t be able to differentiate between hardware. The onboard preamp will allow you to get acquainted with it and make your future search for an amplifier much easier. Now, let’s summarize SADC GN’s the pros and cons in our Dean Acoustic Electric Guitar Review! Gorgeous body built of mahogany back and sides and solid spruce top. Comfortable mahogany C-shaped neck with rosewood fretboard. Cutout for more comfort on the last frets, less bass, and more attractiveness. Die-cast tuners for easy adjustment of every string. Mahogany and spruce each attach their own sounding features to the guitar. Built-in preamp, tuner, and volume controls. Onboard preamp will probably become insufficient for your needs as you become more skilled. As sound is subjective, you might dislike the way the cutout affects the bass. Besides, if you don’t play on last frets that frequently, the cutout won’t be as useful for you. SADC GN is only shipped within the United States. What’s the difference between regular acoustic and acoustic-electric guitars? An acoustic-electric guitar is an acoustic guitar with pickups which convert vibrations of the instrument to an electrical signal to be amplified with an instrument amplifier. In other words, you can connect acoustic-electric guitars to amplifiers, unlike regular acoustic guitars. Usually, acoustic-electric guitars come with onboard amplifiers. Don’t know which one to pick? Determine your needs! 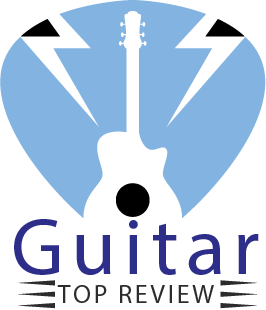 We also got your back with our extensive reviews on some of the best Acoustic Electric Guitars Guide 2018! Will I ever need a full-sized amplifier? For a beginner, the onboard amplifier of this guitar should be capable of anything you might need. But as you become more skilled, you may discover that you absolutely need a separate preamp as it offers more features and better sound. Besides, if you decide to perform on stage with your own equipment, you will need a full sized-amplifier. If you don’t become unsatisfied with the guitar’s preamp, you won’t have to switch to another piece of hardware. Moreover, you probably won’t need an amplifier if you stay an amateur guitar player. That doesn’t mean that you can’t or shouldn’t get a full-size amplifier. If you, for example, have tried your guitar with an amp and now can’t stand the onboard one, you will probably want to get a better amplifier. In this case, you will have to account for your ability to spend more money and free area only. That’s it for our Dean Acoustic Electric Guitar Review! Beautiful wooden body, comfort, and great sound certainly make this guitar a great choice for beginners and even more advanced guitar players. Need to set a starting point for your musical activity? SDAC GN is one of the best choices you can make! Having all the most necessary features, it will certainly help you begin your journey in the art of music. Should you even hesitate? Of course, if you are not sure, think, read, and research more to make your final choice the most right for you. But don’t do it for too long as it will postpone the start of your musical trip! Previous articleGuitar Tips: 10 Best Ways to Rock the World!